"For recognizing and resisting the stream of the world's ways, there are two biblical designations for people of faith that are extremely useful: disciple and pilgrim...Pilgrim (parepidemos) tells us we are people who spend our lives going someplace for God and whose path for getting there is the way, Jesus Christ. We realize that 'this world is not my home' and set out for 'the Father's house.' Abraham, who 'went out' is our archetype. Jesus, answering Thomas's question 'Master, we have no idea where you're going. How do you expect us to know the road?' gives us directions: 'I am the Road, also the Truth, also the Life. No one gets to the Father apart from me' (John 14:5-6)" (p. 17-18). Our focus verse today talks about part of that pilgrimage path. It appears to be the part near the end of the journey. Don't you just love the way Isaiah describes this part of the road — it's bigness (it's a "Highway"), its purity (it's a "Highway of Holiness" with nothing unclean on it), its safety (no one goes astray on it), its music, and its joy! 1. We choose the way we want to go (Psalm 119:30). 2. It's important to choose well, for our choice has implications for eternity (Matthew 7:13-14; Proverbs 15:24). 3. God and our leaders teach us the right way (Jeremiah 42:3; 1 Samuel 12:23). 4. Staying on the right path involves continuing choices for us (Proverbs 9:6; Proverbs 10:17; 2 Peter 2:2). 5. The way we choose impacts private actions as well as public life (Psalm 101:2). 6. 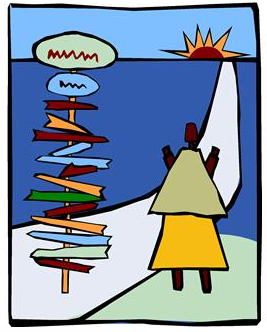 When we get confused about the path, God promises to give us direction (Isaiah 30:21; Psalm 139:23-24). 7. The right path — the path of wisdom — is righteous, level, straight, and smooth (Isaiah 26:7), also described as pleasant and peaceful (Proverbs 3:17). 8. Staying on the right path brings with it the promise of a prolonged life (Deuteronomy 5:33). 9. It leads, finally, to a wonderful destination (Psalm 107:7, as well as today's focus verse). A while ago we attended the funeral service of a friend who was part of the church we were members of years ago. Though it was a sad time, the afternoon had a glad side to it too, as we again met people we had worked with in the nursery, in Sunday School, and on the church board, people we knew well because we had, for years, journeyed side by side. It was also an afternoon of reflecting on where our friend, was now. The hours I spent musing and mingling was to me a brief glimpse of what it means to be on that "Highway of Holiness" — traveling, singing, joyful, and ever hopeful as I make my way, in the company of many others, to a wonderful destination. PRAYER: Dear God, thank You for this picture of life as a journey and Your way as the road. Please guide my steps on it today. Amen. Good works - what and why? Would you change plans because of a dream?